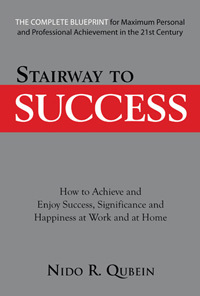 Some people think success comes effortlessly, with no need for effort or conscious planning. All you need to do is be in the right place at the right time—and at some happy moment, success will fall into your lap. Successful people know that in business or any other undertaking, you must plan for success, and you must make conscious choices centered on your core values. On rare occasions, the aimless wanderer may end up in the right place at the right time. On rare occasions, somebody also wins the multimillion-dollar lottery. But most people don’t. The sure route to success lies through careful planning in harmony with a core motivation. Unconscious choices put you at the mercy of the dice roll. Your core motivation is the inner drive that propels you toward a desired goal. Your core motivation springs from your core value — the value you choose to place at the center of your life. You must consciously decide what values mean the most in your life. You arrange them in order of priority and allocate your time and energy on the basis of these choices. Your core value will govern the direction in which you expend your most vigorous efforts. Everybody has a core value. It may be people, possessions, activities or principles. It may be strong or weak and it may be conscious or unconscious, but everybody has one. If you want success on your terms, you have to make yours a conscious choice. I once heard a story about an old peasant in medieval times who served as a stable hand on the nobleman’s estate. One day a wizard happened by and watched him laboring away. “Is a stable hand all you were meant to be?” the wizard asked. “I don’t rightly know,” said the old man. “I have the power to turn you into whatever you’d like to become,” said the wizard. The stable man decided that the easiest way to decide what he would like to be was to wander around the estate, observing people and noting the ones he felt most drawn toward. He felt no great attraction toward the miller or the cobbler or even toward the nobleman and his family. The miller’s job was too strenuous; he didn’t like the idea of lifting all those bags of grain and flour. The cobbler’s job required too many skills; he didn’t want to expend the time and effort to acquire them. And he didn’t care for the weighty responsibilities that burdened the nobleman. Finally, he happened across a peasant woman rocking her baby in front of her cottage. He felt a strong attachment for the baby. So when the wizard returned in two weeks, the old man told him, “I want to be a baby.” The wizard granted his wish. Fifty years later—he being gifted with immortality—the wizard happened past the same barn. And there he saw the same old peasant cleaning out the stable. Instead of proactively deciding what he wanted to become, the stable man left it to passive choice. And what he got was predictable. Very sad.